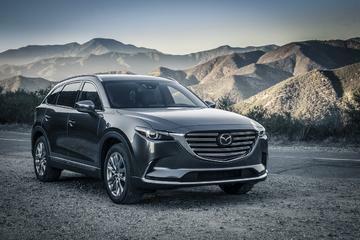 The 2018 Mazda CX-9 is something totally different in the three-row SUV category. Introduced in 2016 as an all-new vehicle, the 2018 CX-9 continues as a stylish three-row alternative to run-of-the-mill SUVs. In terms of upscale features and appearance, it compares very favorably to the three-row SUVs from the high-priced luxury brands. Another area in which the 2018 Mazda CX-9 excels is in its safety features. A wide variety of the latest technologies has been built into the Mazda CX-9 7-seat SUV. These features look out for you, help prevent accidents, and can also minimize the severity of those that you are unable to avoid. The 2018 Mazda CX-9 is available in four different trim levels: GS, GS-L, GT, and Signature. Each trim level has varying levels of standard and available safety equipment. All 2018 Mazda CX-9 models come standard with G-Vectoring Control. This is a safety feature that extracts much more grip from the front and rear tires, improving stability and vehicle responsiveness. G-Vectoring Control also greatly reduces the frequency and size of steering corrections and minimizes the swaying of the head and body experienced by vehicle occupants, producing a much more comfortable ride. Only Mazda has it. Every Mazda CX-9 SUV now comes with Smart City Brake Support (SCBS) with automatic emergency braking. This safety feature is designed to help the driver avoid rear-end collisions with the vehicle in front. This type of collision is the most common, and the majority of these happen at speeds less than 30 km/h. When driving at these low speeds, SCBS uses a laser sensor mounted on the windshield to sense the distance from the car in front. If the system senses that an impact may be about to happen, it first prepares to deliver maximum braking power when the driver applies the brakes. If the driver does not react, the SCBS system will then apply the brakes and reduce engine power in an attempt to avoid or minimize the impact. It’s like having someone in the passenger seat watching out for you! The GT and Signature trim levels of the 2018 Mazda CX-9 come with the i-ACTIVSENSE Package as standard equipment. Additional standard safety features that are unique to these two trims are a traffic sign recognition system, windshield-projected head-up display, adaptive front lighting system, plus front and rear parking sensors. If you are looking for a 7-seat SUV that hasn’t forgotten the importance of safety, take a closer look at the 2018 Mazda CX-9 at Yarmouth Mazda in Yarmouth. It combines luxurious surroundings, driving pleasure and unsurpassed safety features into a very pleasing overall package. Contact us for a test drive.